Northcentral Chapter 8, Society for Pennsylvania Archaeology, has opened its 2013 Summer Dig at the Glunk Site. See the Google Calendar in the sidebar at right for upcoming dates and times, and use the interactive Google Map (yes, in the sidebar) for directions to the site. The Glunk Site has been officially registered with the Pennsylvania Historic Museum Commission, the Bureau for Historic Preservation and has been designated as 36LY0345. at the Glunk Site in 2012. "Archaeological sites are the only record of the prehistoric past and they are an essential part of understanding the historic past. They are a non-renewable resource and they are being destroyed at an alarming rate. Recording archaeological sites helps to protect them. The Pennsylvania Historical and Museum Commission encourages the recording of archaeological site information on Pennsylvania Archaeological Site Survey (PASS) forms. 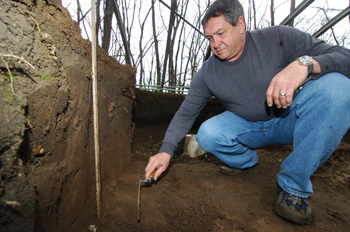 Thousands of avocational and professional archaeologists have already shared site locations with the Commission resulting in tens of thousands of sites being recorded in the PASS files. Information for recording sites can be found at the PHMC Web site. Once the form has been submitted, a site number will be assigned. This number can be written on artifacts from this site so that there will always be a record of where they were found. The PASS number is based on a nationwide system called the Smithsonian or trinomial system. It is divided into three parts. The first part is Pennsylvania’s alphabetical position within all of the states. The second part is the county designation and the third part is the next number available in that county. For the PASS number 36DA0020, 36 is the alphabetical position of Pennsylvania, DA. is the designation for Dauphin County and 0020 is the twentieth site recorded in the county." So, jon us at the Glunk Site this season and help us protect and preserve this area's cultural prehistory.